Official Viwawa Blog: Celebrate Halloween on Viwawa! Its the spooky time of the year again, and this time, we have lots of Halloween goodies to give out, in Buffet Wars! 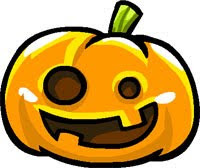 From 8 October 2010 to 15 November 2010, you can collect FREE freaky candies and exchange them for Halloween items. Get the correct recipes and exchange them for Halloween costumes, equipment and more. Read more about it in our forum post, just go Buffet Wars and start playing now!